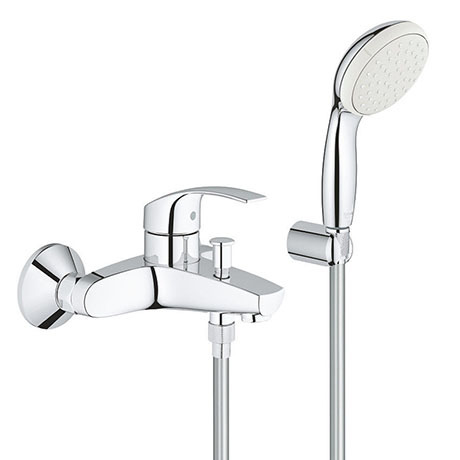 The Eurosmart Wall Mounted Bath Shower Mixer and Kit offers a perfectly relaxing bath and shower. It features EcoJoy water-saving technology which reduces water consumption by up to 9.5 liters per minute, a SpeedClean shower head so limescale residue is simply and easily wiped away and a non-return valve to stop backflow of wastewater into your water supply. Crafted from high quality materials and finished with Grohe StarLight, a special chrome coating that is scratch resistant and easy to clean. All Grohe bathroom taps come with a 5 year guarantee.